I always say I need to blog every week but seem to have so many things come up. I will try to get better at letting you know what my latest adventure is. Wow, I have been busy. I am still editing book 6 working title Magic Carousel. Sure is a fun adventure. I introduce two new characters,Tina and Timothy. I also been editing and writing my novel New Moon Brethren. I had to take a break from my writers group, rather bummed. But just not enough time for it right now. I was asked by Big Rapids Festival of Arts to organize an Authorpalooza Event for them. What a a fun adventure it has become. 40+ authors are coming February 20th to Big Rapids 1pm to 4PM. Plus classic book characters will be wandering around to interact with you. Thanks to Ferris State University Theatre Students. Authorpalooza is on page 59. I have an event page here is the link for it. https://www.facebook.com/events/1107965342554486/. This has been a blast organizing. I am also looking for a children’s literary agent. Been sending out many queries. Gotten a few rejections, The rejections have been much nicer than 10 years ago. So I am getting better. I do hope a agent will want to work with me in the near future, so I can dedicate more time for writing. I also started a Facebook Weekly Children’s Author Spotlight from the FB group Kids Read-Author Promo Group. I put up the dates and authors sign up for a spotlight. Then for a week folks have the opportunity to get to know children’s authors and their book, experiences etc. Check them out and interact with the authors. We love to chat, answer questions with folks. Recently, I have become involved with keeping our water safe. Joined a group who right now are trying to stop an injection well go active in my county. An oil and gas company wants to dump toxic waste from their oil fracking and drilling activities. So I have been educating myself on the issues and going to many meetings and writing many statements and speaking up to our public leaders about how dangerous it really is. At an EPA Public Hearing, a tear jerking moment. A few HS Students spoke and asked us adults to protect the water for them and the future. Of course taking care of my family needs takes priority. Now with three teenagers in the house, we have many drama adventures. Fun fun! Helga Returns Autumn Special Epic Adventure! 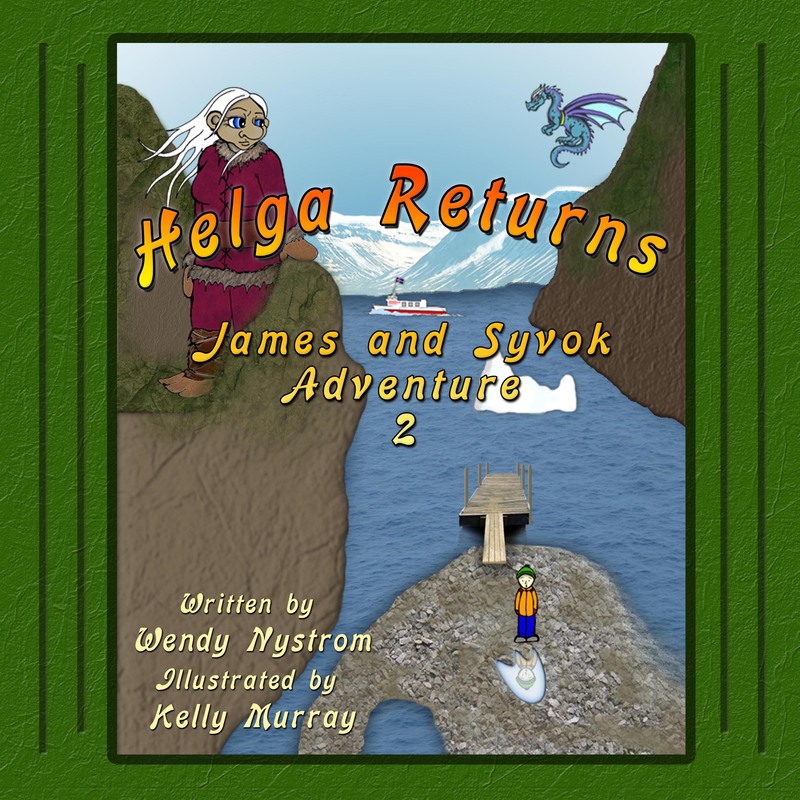 Helga Returns – A James and Syvok Adventure by Wendy Nystrom is about the adventures of James for the second time. He finds a footprint and he asks his friends Syvok and Matthias to help him find out about the footprint. They discover that it is Helga’s footprint and follow it into the troll village. Will they be able to save the troll and will Syvok and Matthias be able to save James? It is an absolutely delightful story for children. The story has many underlying messages in it. I liked the fact that it introduces them to glaciers. Any book is educational for a reader because it will have information to offer that gives you an opportunity to learn. The characters of James, Syvok, and Matthias capture the interest of the reader but the most appealing character is Helga, the troll. Iceland as a backdrop is another interesting aspect of this book. It is a magical story of James along with the two Icelanders, Syvok and Matthias. The story does not lose its tempo and the beautiful illustrations give the characters an identity which makes it easier for children to relate to them. The biggest advantage of adventure stories is that they encourage children to think and be imaginative. It gives them the freedom to dream, experiment, think differently, and create their own characters. I found the little trolls and dragonets very interesting and they add to the whimsical quality of the story. James Saves the Moon ebook where the epic adventures began is always on sale for 99 pennies. “James Saves the Moon”, written by Wendy Nystrom, is a delightful children’s picture book that combines a child’s imagination with Icelandic mythology. The illustrations by Jim Weidman, in a blue tone with colorful characters, lend a mythological feel to the story of a young boy (James), who sees the moon over one of the high mountains and decides that if he climbs to the top of the mountain he can reach out and touch the moon. Slipping quietly out of his bedroom window, he sets out on his journey. On his way up the mountain he stumbles over some rocks and disturbs one of Iceland’s mythological figures (Syvok), who joins him on his journey. They suddenly realize that unless they move faster, the moon will leave before they make it to the top of the mountain. In order that they can move faster, Syvok summons a dragon (Matthias), who allows them to ride on his back. They discover that the moon is stuck on the mountain and they will have to help get it unstuck. The three work as a team to set the moon free and while doing so, James truly does touch the moon. 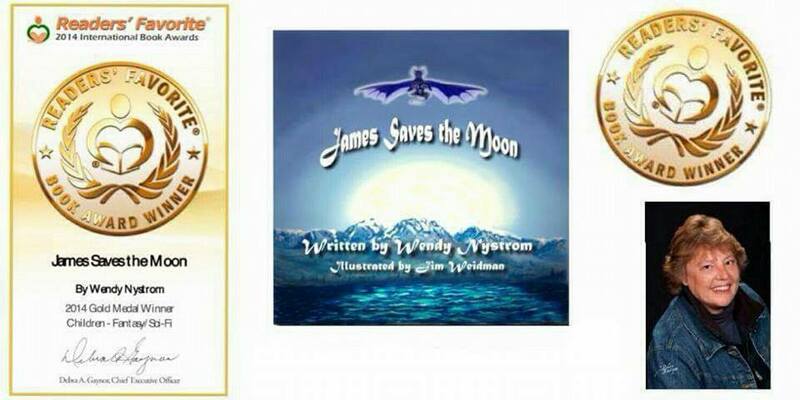 make “James Saves the Moon” a rare treasure for a children’s picture book. Its simplicity combined with the kind of story that stirs the imagination of a child make it something that will stick in the mind of the reader for a lifetime. This book gives a little bit of a taste of the colorful and flavorful history of Iceland and its traditions. It is highly recommended for its ability to help stir a child’s imagination. A wonderfully simple and delightful tale. A year ago today I lost all memories of this day and my head went platinum. I remember most of March 2nd but not March 3rd. I went to the ER in my small city thinking I needed some fluids for the flu after being ill for 9 days. This was right after turning 50 and the next day was in bed with flu symptoms. I did go to the ER in the middle of the 9 days but their was a bunch of chaos so I told my husband to take me home. Anyway the second time going to the ER on March 2nd, I walked in with my husband at my side weak and my left brown eye had moved towards my nose. I had double vision and thought I will get some fluids and feel much better. I guess I was complaining of a head ache but do not remember that. The ER doctor immediately put me in a bed and called to have me transferred to a hospital in Grand Rapids. I did have a scan which showed I had two bleeding aneurisms. The ambulance arrived and I enjoyed chatting with the nice young woman EMT person sitting next to me. Upon arriving at the hospital they set me up in intensive care and then rolled me down to have another scan. Jim my husband arrived by the time I was returned to my room in intensive care and a neurosurgeon arrived to inform us about my condition. Pretty much the last thing I remember. The next day March 3rd I had brain surgery. I do not remember any of this day. They placed two platinum coils in my arteries to stop the bleeding. It worked and and they did not have cut open my head. They went all the way to my brain from the inside of my thigh. The little tiny wound never bothered me at all. I remember my second visitor Chris Fox. Sorry Amy Bowling I don’t remember your visit. March 4th,I remember arguing with a nurse about getting up to go to the bathroom. She wanted me to use a bed pan. Nope not doing that as long as I could get up. She told me I was an unusaul patient in ICU with my condition most are unconscious. When I told my friends this they all laughed and said nothing stops me from talking and being bossy. On the 5th day they moved me out of the ICU and discharged me from the hospital. I walked out on my own. A year later enlightenment. Upon arriving home my kids all hugged me and were happy I was home. I found out my wonderful neighbors the DeBolds picked up my kids at school and made dinner for them, hung out with them at the house so my husband could come down and be with me. My mother in law did not have to to come out to help. Luckily my husband was on sabbatical so he could be with me 24/7 during my recovery. I was really lucky I also discovered all these people in my small city of Big Rapids who care about me. My friends Robin Stratton and Chris Fox set up an update page on Facebook. My friend Candice Simpson posted on my pages for me. My publisher delayed the release date for book 4 Amongst the Clouds, she told me to just let her know when I am able to read the edits from the editor. I am really a truly blessed person. My recovery has been remarkable. I rested for a couple weeks. Then began making dinner again, my kids were so happy because their dad just does not cook very well. In may I started walking around the block and increased the distance when I felt strong enough. When the snow came I started yoga+ low impact work out. My husband was concerned I may slip so did not want me walking by myself. It got to cold anyway. I traveled to Orlando to pick up a best childrens award for Helga Returns by myself. I got to meet some people who I met on Facebook in person and they are more wonderful in person and now friends in the real world too. MCV Egan and Jodi Stone two talented authors and truly beautiful in person been traveling this writing adventure with me for years on facebook it was so wonderful to hug and laugh in person. It is quite interesting traveling with double vision. My spectacular in-laws arrived in June and helped me around the house. My vision was back to normal and they took the kids a week later on a wonderful trip to D.C and Niagara Falls. I started writing again while my kids were on vacation. This was one of the things I was truly worried about not be able to spin a story again. My dearest pals picked me up for ladies night out when I was ready to be in public it was fun seeing two of each at the dinner table and I managed not to spill anything in the restaruant. One of my first outings in town was to stop in a pick up my favorite chocolates down town at the Old Pioneer store and the wonderful owner ran up to me gave me a hug. Carleen told me how happy she was to see me alive and doing so well. This past year I have traveled, inspired a classroom of children to write, talked about writing to Ms Cosper’s university students, talked with families and children in Cadillac. Brought in 20 authors to our community library with the help of Diane Scarpelli and Library director. Worked with some incredible people in the community. Published two more children’s books. My muse from my novel visited me every time I slept help to heal me and told me the story of the New Moon Brethren. Fun times and travels with my family. I recently joined local writers group to help with my writing and discovered some more incredible talented folks. And it helping me focus and be able to write for longer periods of time. I have had a fun filled year of adventure and was enlightened of how blessed I am with family, and friends and what a wonderful community Big Rapids truly is. Enjoyed a fun filled family Christmas trip southwest. I still walk a little funny but it hardly noticable and at times stumble with words but it is truly wonderful watching my children grow and achieve, talk with my husband every day. I make sure I tell my family I love them every day. I want to thank everyone for all you do and how spectacular you are. Every day we wake up is truly another wonderful magical adventure so enjoy each day! March is reading month. Most schools have fun themes to get kids reading. Ask your kids what the reading theme is this year and their reading goals. Then set aside time every day, or a couple times during the week, for everyone to sit down and read. Even if it is only 15 minutes you will be amazed how many pages you can read in 15 minutes. Then discuss what is happening in your book, newspaper, magazine etc. at dinner, driving or after you are done reading each night. Reading is a exciting adventure for all. Just a reminder I have five magical adventure books available on Amazon and Barnes and Nobles for children ages 7-12. They are illustrated chapter books and read much like a graphic novel for children. Tell us what your or your children’s reading adventure for March reading month. My twin twelve year old girls are reading the Percy Jackson and the Olympians series. Children Books Recent Release and More Magical Adventures! Today I have decided to talk about my books that I have written and are available. This is my favorite cover. Santa’s reindeer broke his sleigh! 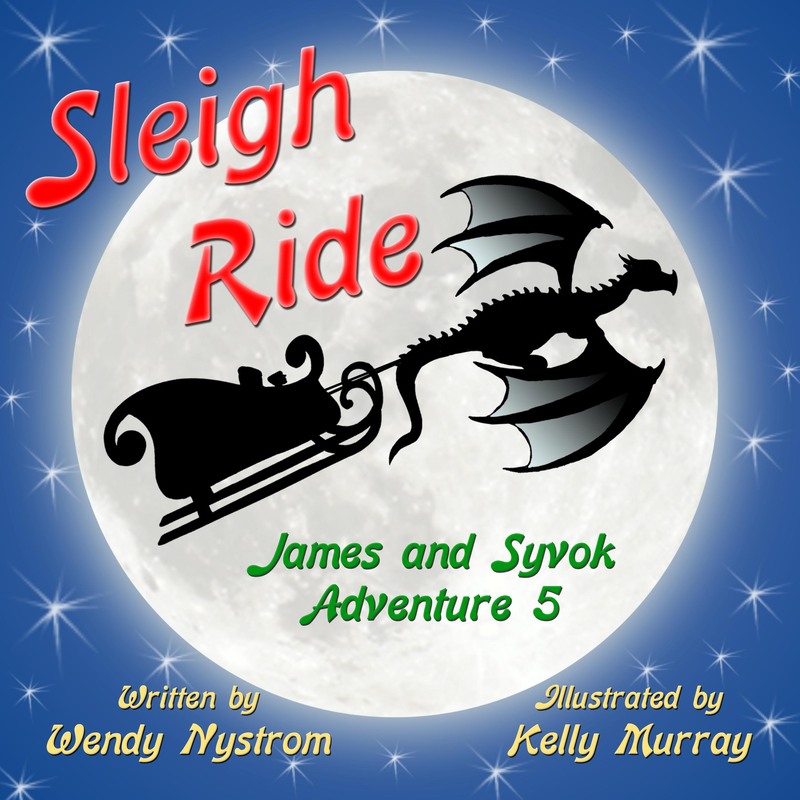 James and Syvok get whisked away to try to help save the day with Matthias, the dragon. Along the way there are delays, pondering the question-will Santa have a sleigh in time to deliver the presents? Come along with old friends, meet new friends, and enjoy the Yuletide adventure! Review: By Candice Simpson, Are you ready for another adventure? This is sure to be a hit! James finds his friends await him for a magical Yuletide trip, because the reindeer have been naughty and Santa needs a little help from the Icelandic Yule Lads. Those bad reindeer! You will sail off on a magic sleigh ride with Matthias the dragon leading the way with his friends to help him carry the sleigh! You will also get caught up in a very special rescue! And then after the special rescue they are off to Santa to save the day!This is one of those books that just draws you in from the cover! I got to see the print edition a couple days ago. The way the cover just pops with that realistic sparkle. Ah! Its gorgeous. The words flow right into the illustrations and the story becomes a page turner! If your children love Christmas stories with fun, adventures, and more-this is the one to have arrive at your door! I love how Wendy writes for children to enjoy. She draws the adventure, adds a little mystery, and wraps it up with surprises and fun in a realistic way. This particular book is one I would pass down to my grandchildren, and will make a holiday tradition (like her other holiday book- Tomfoolery and 13 Yule Lads of Iceland).Don’t forget to check out the first four adventures that James and Syvok embark on! And enjoy the newest holiday delight! I know my children couldn’t wait to read it, and are still loving it! They are looking forward to sharing it with their teachers and friends this holiday season! It is available on Amazon Ebook or print. 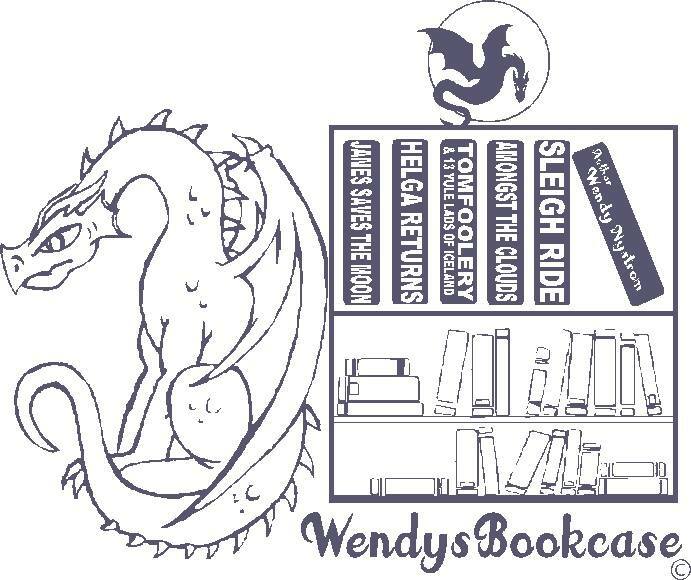 Sleigh Ride Amazon Link If you order it online you can contact me at wendysbookcase@gmail and I will send a signed book plate you can adhere to the inside cover. Actually I will do this for any of my books purchased online for free. James and Syvok 4th adventure has a new mystery floating about. James is curious to explore the iridescent cloud. All the colors of a rainbow glow, surely there are adventures to sow. Come along and meet new friends! Dragons, cats, troll, and more, lots of fun is in store. Join the adventures up in the sky and help the wizard find her magical key. Come and see what the iridescent cloud hides! 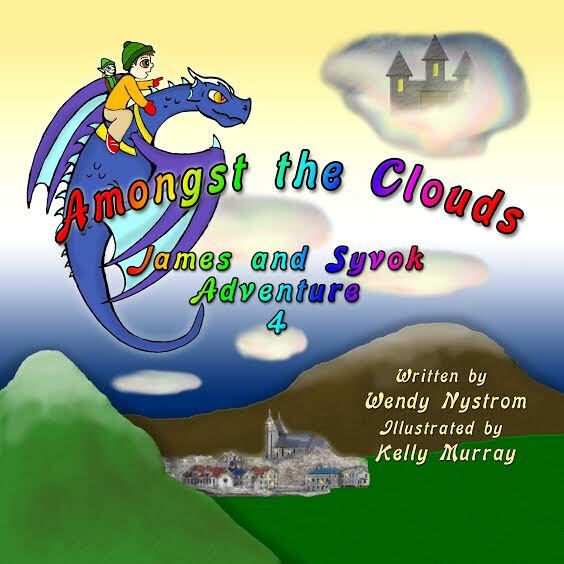 5 Star Review from Readers Favorite: Reviewed by Michelle Stanley for Readers’ FavoriteAmongst the Clouds (A James and Syvok Adventure Book 4) is a fantasy by Wendy Nystrom. James lives in Akureyri, Iceland, where everything seems unusual. He notices an odd, rainbow coloured cloud following him when he meets his magical friends, Syvok, a fairy, and Matthias, a blue dragon. Matthias takes them flying on his back. They examine the cloud that has a door, and Ranni, James’ former teacher, opens it. Ranni tells them the cloud is her home, but needs their help to save it. She lost the key that opens her spell book and wants them to find it, or she will be stuck in one location. Old Hag, a witch, coveted the key and cast a transformation spell to steal Ranni’s home and do more evil. The friends discover what she is up to, but it may be too late to stop her malicious plan.Amongst the Clouds (A James and Syvok Adventure Book 4) is a fun book young readers will like. Wendy Nystrom, who created this lovely story, writes wonderfully well. Her characters are unique and the plot is original. Although this is the fourth book in the series, the author included sufficient background information about the characters and previous events, so I was able to understand certain activities taking place. The personalities and antics of Old Hag, her cowardly husband, Ragamuffin, and pet, Yule Cat, are amusing. 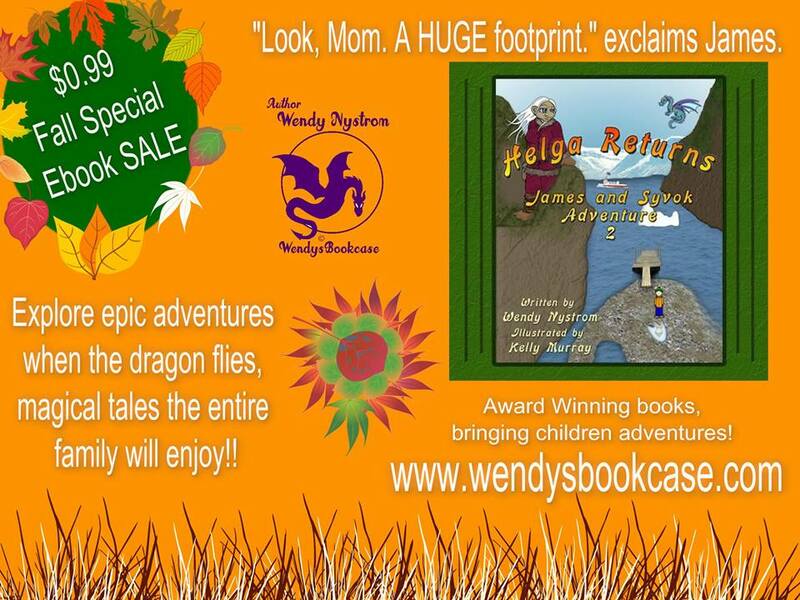 Wendy Nystrom will keep children entertained with her exciting fantasy stories. They will enjoy this Amongst the Clouds adventure. One of my favorite Icelandic legends is the 13 Yule Lads. More Christmas adventures. This book has three adventures in one book. The first Yule Lad arrives December 12th. Thirteen Santas! How neat! Thinks James as he and Syvok set off on their third adventure. Little did he know the mischief these Yule Lads were capable of getting them all into. Join James, Syvok, thirteen Yule Lad’s and, of course, Matthias as they cause a raucous, create laughs, and create a Yuletide that you and James will always remember. Readers Favorite 5 star review: Reviewed by Mamta Madhavan for Readers’ FavoriteTomfoolery and 13 Yule Lads of Iceland (James and Syvok) by Wendy Nystrom is an ideal story book for children and its seasonal theme makes it even more relevant right now. James and Syvok set off on their third adventure. There are 13 Santas and they create a lot of laughs and fun for the reader, giving them an unforgettable Yuletide. The book is light-hearted and silly and it will take children on yet another exciting adventure this season. You can join them and celebrate Christmas the Icelandic way. You can start planning for Christmas from here. It is a book filled with loads of fun, perfect for any child reader. The illustrations are very bright and cheerful and they contribute to the Christmas spirit of the story. The traditions of Iceland are very informative and interesting for the reader to learn. Their customs are so different that it makes readers aware of other cultures. It is also a novel way of introducing children to the traditions of a new place in a fun manner. This adventure story book is perfect with wonderful imagery. 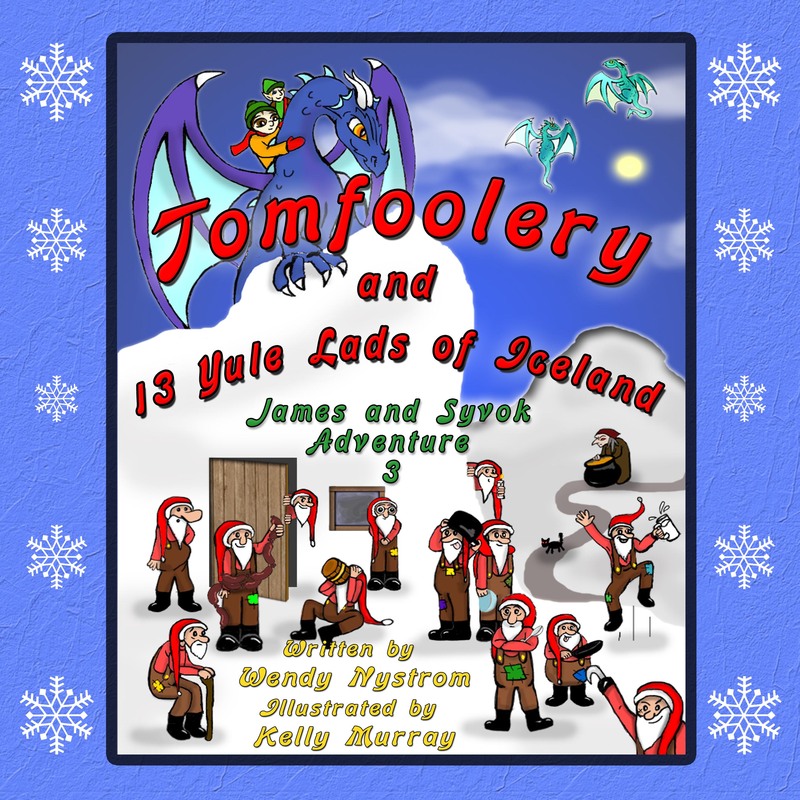 Tomfoolery and 13 Yule Lads of Iceland (James and Syvok) by Wendy Nystrom is the 3rd book in the James and Syvok Adventure seriesis inspired by Icelandic folklore where the lads bring gifts and mischief to children the 13 nights before Christmas. Once James and his magical friend Syvok meet the 13 Yule Lads of Iceland, the lads decide to spend the night at James’ house each night after delivering the gifts. How will James prevent his parents from finding out that he has these noisy house guests clanging pots, slamming doors and generally creating a huge ruckus? As I read this book, it was more fun than the 10 Little Monkeys Jumping on the Bed crossed with the excitement of The Night Before Christmas.This delightful book is for young children, but I found myself laughing out loud at some of the antics of the 13 Yule lads. Available on Amazon Ebook or print and B&N nook. What happens when James discovers a huge foot print.Helga Returns traveled to Orlando in April 2014 to receive best children’s ages 9-12 award from Turning the Pages Magazine award ceremony. James’ second adventure begins with a footprint. He once again calls out to his Icelandic magical friends, Syvok and Matthias, to discover what it means. He will find Helga, the troll who left the footprint. James follows Helga to Yamas, the troll village. Will they be left on a glacier or will they save the Guardian Troll from danger? Will Syvok and Matthias reach James in time to save him when the earth tremors? Ms. Nystrom once again creates a wonderful mystical adventure in which she uses the wonderful Icelandic backdrop for a beautiful mythology. The story of James, Syvok, and Matt, continues as the battle the mountain trolls of Iceland in a wonderfully warming tale. All ages can get absorbed in to magical journey of friendship, bonding, and an impervious boy who’s innate curiosity leads us all into the depths of our imaginations. Thanks to Ms. Nystrom for wonderfully woven adventure through Icelandic folklore to spin a tale that leaves you feeling gratified and yet wanting more of our precious pair and their intelligent transport. This is the first in the James and Syvok adventures. My son inspired this story and my writing began after he really saw the moon sitting on the mountain one day while living in Iceland in 2005. James informing me that he was going to climb the mountain and touch the moon unlocked many stories for me that I did not know were there until that moment. 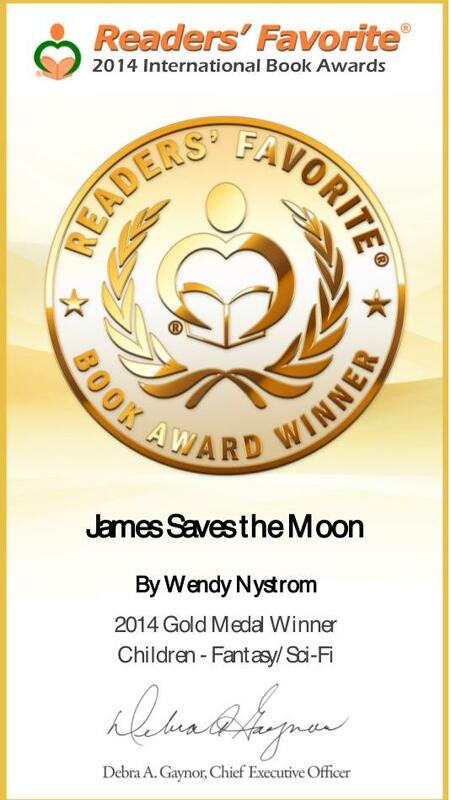 James Saves the Moon traveled to Miami to receive a gold medal 2014 from Readers Favorite International Awards Children’s Fantasy. Travel along with James up the mountain, soaring through the air with his friends he meets along the way to reach the moon. 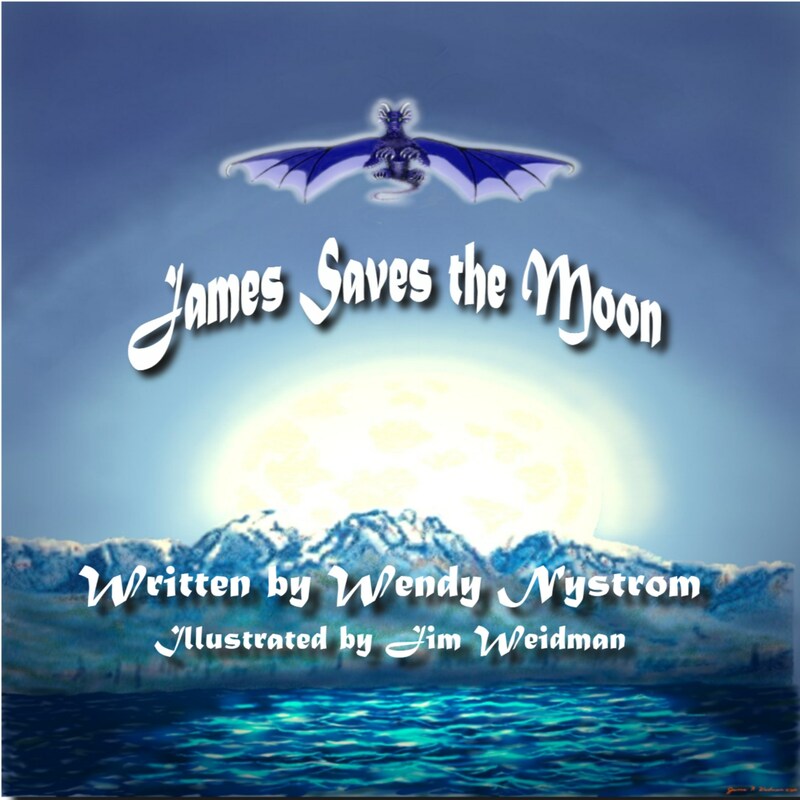 “James Saves the Moon”, written by Wendy Nystrom, is a delightful children’s picture book that combines a child’s imagination with Icelandic mythology. The illustrations by Jim Weidman, in a blue tone with colorful characters, lend a mythological feel to the story of a young boy (James), who sees the moon over one of the high mountains and decides that if he climbs to the top of the mountain he can reach out and touch the moon. Slipping quietly out of his bedroom window, he sets out on his journey. On his way up the mountain he stumbles over some rocks and disturbs one of Iceland’s mythological figures (Syvok), who joins him on his journey. They suddenly realize that unless they move faster, the moon will leave before they make it to the top of the mountain. In order that they can move faster, Syvok summons a dragon (Matthias), who allows them to ride on his back. They discover that the moon is stuck on the mountain and they will have to help get it unstuck. 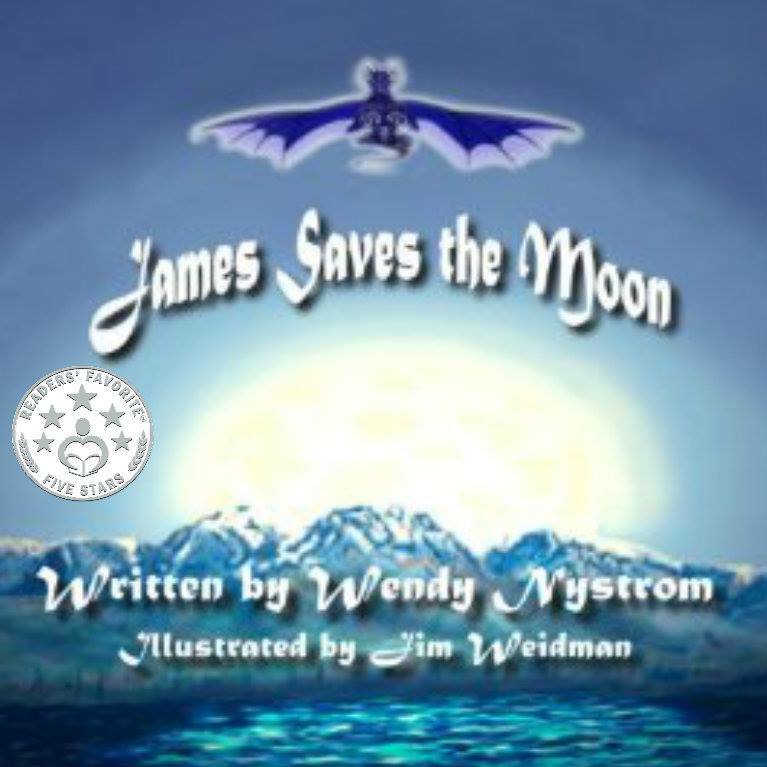 The three work as a team to set the moon free and while doing so, James truly does touch the moon.The color of the illustrations by Jim Weidman and the very well-written story by Wendy Nystrom make “James Saves the Moon” a rare treasure for a children’s picture book. Its simplicity combined with the kind of story that stirs the imagination of a child make it something that will stick in the mind of the reader for a lifetime. This book gives a little bit of a taste of the colorful and flavorful history of Iceland and its traditions. It is highly recommended for its ability to help stir a child’s imagination. A wonderfully simple and delightful tale. We are researching to see how your children find books! Where do you shop for books for your children? And what draws you to a book? Are there websites you browse? Do you look at book ads, or do you just go to your local store? How do you feel about supporting local children’s authors? Do you know they exist? Would you buy more local if you had the opportunity? Amongst the Clouds released late July. It is now available in ebook or print. You kids and you will love this adventure flying amongst the clouds. Find out what is hidden in the clouds and join James, Syvok, Matthias, and others to help a friend in need. Old Hag whom you met in book 4 Tomfoolery and 13 Yule Lads of Iceland is up to no good and must be stopped. 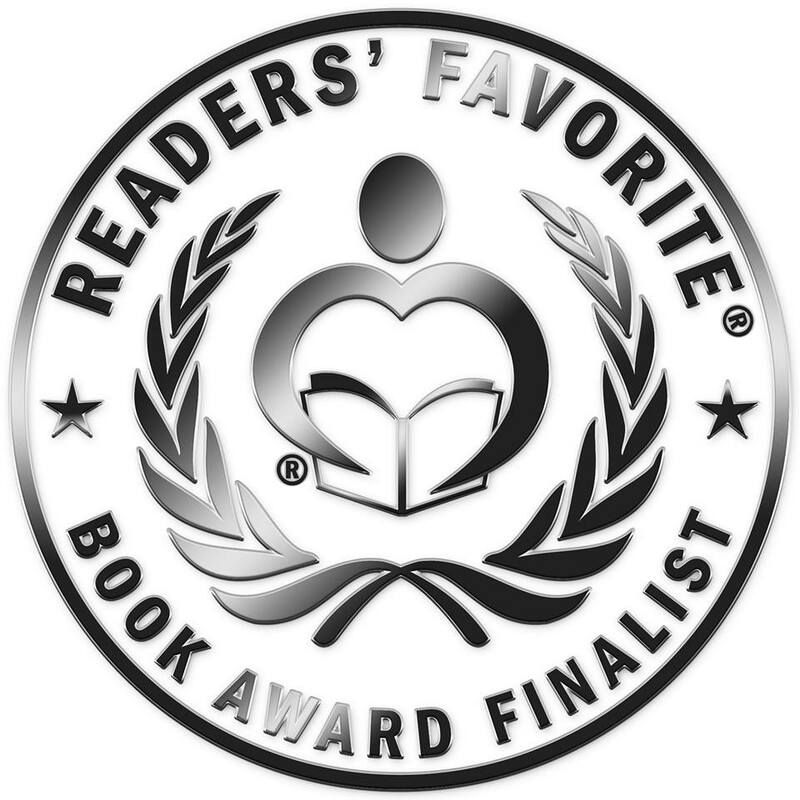 My other news is my First book James Saves the Moon is a finalists with Readers Favorite Award. The awards will be announced September 1. Super exciting news. This where the adventures begin for James, Syvok and Matthias after seeing the moon on the mountain. Ebook on sale for only 99 cents.